The parish AGM. votes that 10% of the offertory collections at the two churches in the parish goes to support parish charitable projects. Click on the picture of Florence above to see the 2017 CAFOD Lenten Appeal Video. CAFOD - Catholic Agency for Overseas Development - a major British charity which has been fighting Third World poverty since 1962. ‘We believe that all human beings have a right to dignity and respect and that the world’s resources are a gift to be shared by all men and women whatever their race, nationality or religion.’ Their programmes include education and skills training, health care, provision of safe water and the development of agricultural and business projects. They also respond to emergencies such as war and famine They campaign on behalf of the world’s poor and raise awareness through education programmes. Only 8 days later, China, from whom aid might naturally have come, was hit by a massive earthquake, measuring 7.9 in magnitude, which was the costliest disaster in Chinese history. 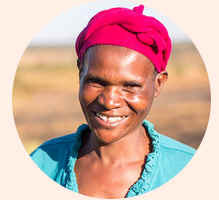 Click here to link to the CAFOD site. .
CAFOD's campaigns this year involve encouraging some of the poorest in Zambia to build fishponds. The fish to initially populate them are supplied by CAFOD, and they can make a living from harvesting them when they have grown. They are also committed to encouraging use of renewable energy by supplying solar panels. One person in every 6 on the planet has no access to electricity. Many of these live in arid, hot areas where solar panels are very effective. This small investment massively changes the lives of people. The Government is YET AGAIN matching pound for pound every donation made to the Lent appeal, which must be targeted at the poorest 50 countries in the world. Any donation made AFTER ASH WEDNESDAY (18 Feb) and before Sunday 17 May will be doubled by the government before it arrives at CAFOD. Please note that donations made before or after those dates will not be doubled, so please time your giving carefully to get maximum benefit to the people who need it most. The 2012 Lenten Appeal was about clean water provision Click here to link to the CAFOD site. The Government is matching pound for pound every donation made to the Lent appeal, which must be targeted at the poorest 50 countries in the world. We have set a target of £2012 to aim for, in obvious deference to the year, which will be doubled as a result of the Government scheme..
As of the end of the appeal, we raised over £3000. This was then matched pound for pound by the government, resulting in over £7000 going to CAFOD as a direct result of the generosity of the Parish. Many thanks to all who contributed and supported so generously to all the activities which led to this excellent total. Water, health etc. provision in Madagascar. Also, CAFOD is ongoing, as above. Sadly, we have been forced to stop the Fair Trade shop at Wellington each month. But at Wivey it still takes about £30 (4th Sundays.) This is run in conjunction with Wellington Methodist Church who order the goods for sale. Used postage stamps are collected for the missions.